^ Zhang Zengxin; Tao Hui; Zhang Qiang; Zhang Jinchi; Forher, Nicola; Hörmann, Georg. 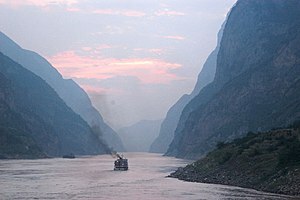 “Moisture budget variations in the Yangtze River Basin, China, and possible associations with large-scale circulation”. Stochastic Environmental Research and Risk Assessment (Springer Berlin/Heidelberg) 24 (5): 579–589. doi:10.1007/s00477-009-0338-7. ^ 大矢 2006, p. 82. ^ 大矢 2006, pp. 84-88. ^ 上野 2011, p. 108. ^ 上野 2011, p. 110. ^ 上野 2011, p. 91. ^ 上野 2011, p. 67. ^ 上野 2011, p. 71. ^ 上田 2009, p. viii. ^ 上田 2009, p. 102.